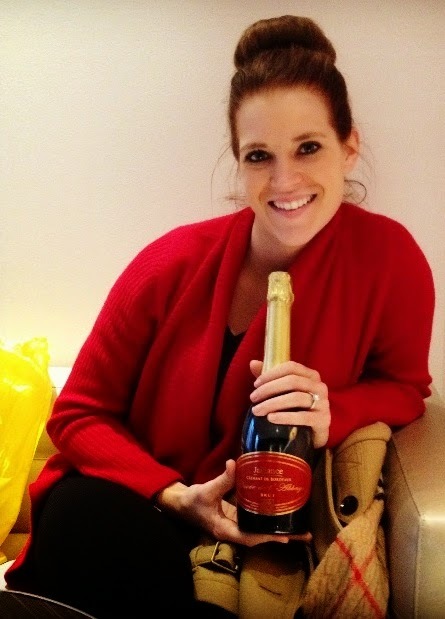 Samantha Angell: Travel & Lifestyle Blog: Wednesday Wine 101: France! Welcome back to another week of Wednesday Wine! After exploring wines from Germany, Norway, and South Africa over the last few weeks, today I will teach you more about wines from France, the world's largest wine producer (in terms of volume). Each year, France produces around 7-8 billion bottles of wine. French wines tend to be popular among those who know them, and quite confusing to those who don't. This is because French wines are labelled according to appellation- where the wine comes from. Popular appellations you have likely heard of include Burgundy and Bordeaux. Yes, Burgundy and Bordeaux are not types of grapes or wine- it is the origin of where the wine is from! As an introduction to French wines, we will look at some of the most common French wine appellations and characteristics of wines that come from there! Champagne while in Paris, France! Bordeaux: Bordeaux is by far one of the largest and most famous wine regions in the world. Bordeaux is best known for producing fruity, tannic red wines. The most common grapes are Cabernet Sauvignon and Merlot, with most red wines produced here being a blend. Rhône: Rhône is another region very popular for producing rich, full-bodied red wines- if you like California reds, Rhône Valley wines may be a great place to start your French wine adventure. The most common wines produced in Rhône are Syrah and Grenache blends. Northern Rhône is known as the birthplace for Syrah, so if you are first trying out Syrah choose a Rhône bottle. You will find it to be full-bodied, savory, and smooth throughout. Alsace: Alsace is located in Northern France, close to Germany. Partially because of this, Alsace is best known for producing Riesling, Pinot Gris, and Gewürztraminer wines. If you are looking for a dry Riesling, Alsace will produce for you. Additionally, Alsace is interesting and different from other French wines in that they are allowed to place the grape varietal on the label, so you can easily tell what you are drinking. Loire: Loire has a length of 600 miles, and produces nearly every type of wine you can imagine. However, Loire is most famous for producing Sauvignon Blanc and Chenin Blancs. Burgundy: Burgundy is another one of the world's most famous wine producing regions, located in Eastern France. If somebody says red burgundy, they are referring to Pinot Noir, while white burgundy is Chardonnay. Burgundy wines will be aromatic, complex, and flavorful. Champagne: Champagne, of course, is best known for producing champagne. Read all about champagne here! In short, with wines from France, the wine will tend to be less fruity and have more earthy flavors- think slight flavors of dirt or chalk, not raspberries or cherries. "Vin de Table" is important to remember as well- these wines are not claimed to be from a certain region or appellation. My best advice for French wine is to pick a grape you typically like, and grab a bottle from the region known for that grape! For example, I would personally choose a bottle from Burgundy, while I have many friends who love Rieslings and could easily try out a bottle from Alsace! Wednesday Wine 101: German Wines!